Macomb County is home to a robust transportation and warehousing sector that supports the county’s bedrock industry of manufacturing. With a large network of manufacturers producing more than $34 billion of goods each year, and requiring an input of $13 billion, the county’s economy relies on industries providing transportation of cargo, warehousing and storage for goods, and support activities related to modes of transportation. The Detroit/Toledo/Windsor trade corridor has the capacity, skills and world-class infrastructure to move products effectively and efficiently throughout the region and globally. In 2014, the region was the fifth largest export market in the United States. Utilizing air, rail, water and road, merchandise shipments totaled $50.3 billion. In Macomb County, the transportation logistics and warehousing industry is comprised of more than 500 businesses. Combined, they employ more than 8,500 workers. Transportation logistics and warehousing is one of the most in-demand industries in Macomb County. Data provided by the county’s economic data partners at Economic Modeling Specialists Incorporated (EMSI) show that the most openings right now are for truck drivers and individuals with commercial driver’s licenses. Seven out of the top 20 job openings in the county right now are within the transportation logistics and warehousing industry. As the manufacturing sector continues to show healthy and consistent growth, there will continue to be an increased demand for the ability to handle the supply chain within the industry. With more than 1,100 sites in operation within in the county, we will find a place for your business to grow. Available warehousing facilities currently on the market in Macomb County range from 2,000 square feet to 1.65 million square feet. Whether your need is rail access, proximity to highways or large-volume warehousing, Macomb County has a place for you. Macomb is strategically located in close proximity with Canada. 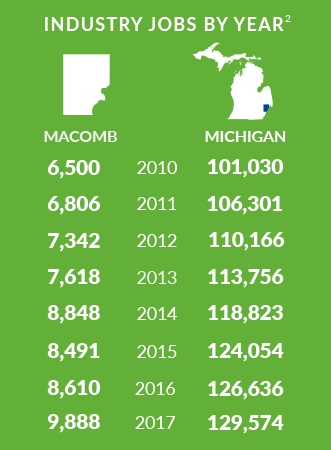 Michigan accounts for more than 50 percent of the U.S. trade with Canada, with almost all of that handled within minutes of Macomb County at international border crossings in Detroit & Port Huron. Kroger was searching for a distribution site in Michigan. While working with the Michigan Economic Development Corporation, they discovered a former industrial building site with a large parking lot close to the expressway that was available in Chesterfield Township. Macomb County’s business development team was asked to assist with local matters relating to use, permits and zoning . The company distribution site is now flourishing with 350 full-time employees and 100 trucks in and out of the facility daily to destinations all over Michigan. Amazon will open a new distribution facility in Shelby Township, creating more than 1,000 transportation logistics and warehousing jobs. The location for the more than 1-million-square-foot distribution center was chosen because of economic development resources from multiple state and local agencies. Amazon was granted a local tax abatement on half of its property taxes and was given $10 million from Michigan's Brownfield Redevelopment and $500,000 from the county in roads upgrades near the site. The facility will serve Amazon's customers in Michigan, Ohio and Indiana. Anji Logistics is a Chinese automotive distributor that established its first location in the United States in 2017. Landing in Warren, Anji Logistics, a globally recognized leader in supply chain innovation, selected the location based on the region’s reputation as the world leader in the product life cycle of automobiles. The company is now positioned to play a role in warehousing, storing and just-in-time shipments, optimizing a 154,000-square-foot facility. 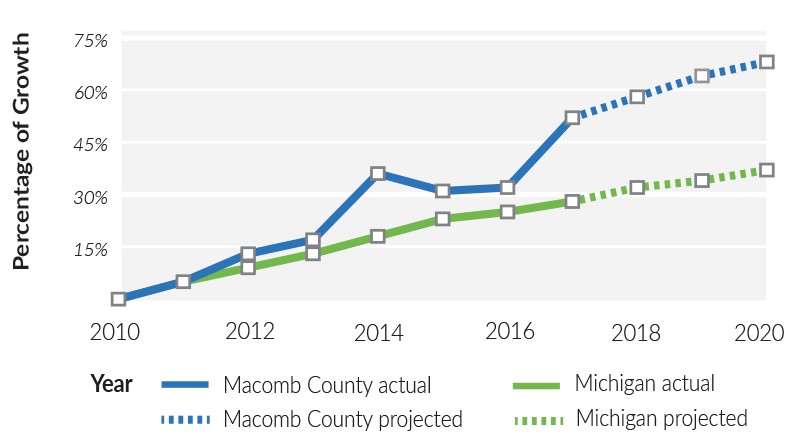 Macomb County provided assistance with hiring and training through Michigan Works and continues to assist as needs arise. Storage and Transportation Co., Inc.
Wings & Wheels Delivery Inc.